I watched the Gadget Show on 5 last night because I was interested in hearing what cycling gold Rebecca Romero would have to say about folding bikes. What interested me most, in fact, was that she said she hadn’t ridden a bike since winning the 3km individual pursuit in Beijing. I guess that’s the difference between using a bike to get around on and doing what it takes to win a gold medal. I do cycle for leisure and fitness; but for me cycling is primarily a means of transport and I ride a bicycle on most days. I’ve always hankered after a folding bicycle but never could quite justify the purchase: after all, I already had a touring bike and a “mountain bike” (in quotes since it never went near any mountains; rather I used it as a sturdy bike to which a child seat could be fitted). My children have their own bikes now and the mountain bike has long gone. A couple of years ago I decided to finally buy a foldie. I regularly visit my employer’s London office, and a folding bike gets me to either of the Bristol mainline stations (Temple Meads and Parkway), and between Paddington and Farringdon at the other end of the journey. Also, I can fold up the bike and sling it in the back of the car — very handy when driving somewhere to cycle with the family. I decided on a Strida. 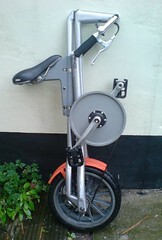 A Strida 3, in fact. I’ve been generally happy with it. I used it this morning when I dropped the car off at the garage for its MOT. Rebecca Romero reviewed the latest Strida, a Strida 5, last night. It’s half as expensive again as the model I bought, and looks to be the same distinctive design but with several components tuned and improved. She found it an uncomfortable ride and couldn’t wait to get off, resulting in a final verdict of just one out of five stars. My experience with the Strida has been very different. I enjoy riding mine. I wouldn’t want to go a long way on it. 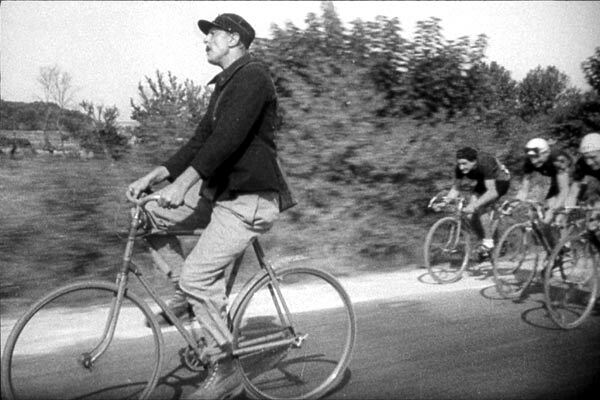 It has just one gear, and while the upright riding position makes for fun — you feel a bit like cycling postman Jacques Tati in the picture above — it certainly isn’t the most efficient. Who cares? I’ve got a road bike for long distances. The Strida is for nipping to and from stations, or across town. For such use it’s great. Believe it or not, I managed to cycle mine up Bristol’s notorious Mont D’Arbres Neuf, a hors catégorie climb so savage Google maps refuse to offer directions up it, though I did have to tack from side to side of the road. 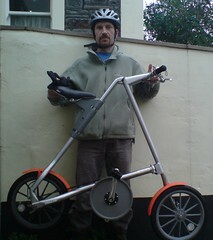 The Strida is light. It’s a doddle to assemble. The brakes are positive. Just getting on it makes me smile. I get smiles when I ride it too. It’s pretty much zero maintenance. The chain is kevlar and nothing needs oiling — very nice for a bike you might want to park indoors. 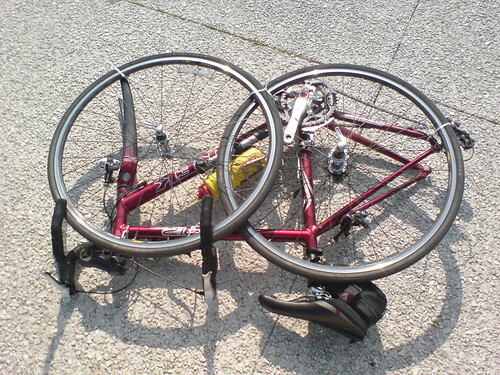 the kevlar chain can slip if you apply too much force on a wet day. All in all, I think I made a good choice. Nowadays I wouldn’t want to be without a foldie.